The HomeSeer HomeTroller S6 PRO Home Automation Controller is a software-based home automation hub that allows you to control your home from your computer, or even over the Internet. Unlike HomeSeer's previous Linux-based SEL HomeTrollers, the S6 features a streamlined embedded version of Windows 7 Pro, making this model easier to use for the average homeowner. 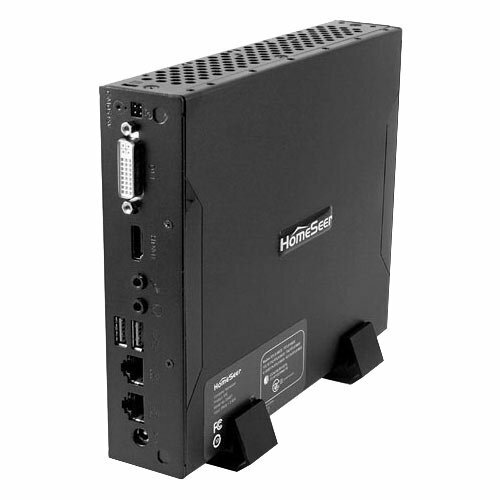 The S6 also offers twice as many USB ports as the SEL controller, as well as two serial ports. Finally, the S6 is housed in a rugged, all-metal case that can be wall-mounted or placed on a tabletop with the included accessories. The HomeTroller gives you comprehensive, versatile control of lighting, appliances, security, HVAC, and infrared (IR) devices, such as home theater equipment. It supports devices from many Z-Wave manufacturers, including (but not limited to) Aeon Labs, RCS, GE, Leviton, Linear, Honeywell, Everspring, Evolve, Kwikset, Schlage, Baldwin, Yale, Cooper, Fibaro, and FortrezZ. The controller is also compatible with X10 and UPB lighting controls, Global Cache iTach devices, and more. The S6-PRO unit is equipped with full HS3PRO software and the unlimited version of the HSTouch graphical user interface (GUI) for use with touchscreens, smart phones, tablets and other devices. This full HSTouch version includes a powerful designer that allows you to fully customize your GUI. You can use your own backgrounds, buttons and graphics to design the interface you want. If you have any questions about this product by HomeSeer, contact us by completing and submitting the form below. If you are looking for a specif part number, please include it with your message.